According to the Hindu scriptures, every elemental force is presided over by a deity. The presiding deity of tejas, fire and heat, is Agni. The religion of the Vedas being mainly centred round sacrificial rites, Agni the god of fire naturally gets the pride of place in the Vedic hymns. A large number of them are devoted to describing and praising him. He is often eulogised as the Supreme God, the creator, the sustainer and the all-pervading cosmic spirit. All the other gods are his different manifestations. He manifests himself as fire (agni) on this earth, as lightning and air (Indra and Vāyu) in the sky and as the sun (Sūrya) in the heavens. He acts as a mediator between men and gods by carrying the sacrificial offerings of men to gods. He is all-knowing and all-powerful. He is all-merciful too. Though an immortal he lives among the mortals, in every house. He protects them by dispelling their difficulties and fulfils their wishes. Without him, the world can never sustain itself. In the epics and the purāṇas he is said to have been born out of the face of the Virāṭ Puruṣa (Cosmic Being), married Svāhā, the daughter of Dakṣa, consumed the Khāṇḍava forest with the help of Arjuna whom he rewarded with gifts of divine weapons like the bow Gāṇḍīva, helped Indra to be relieved of a part of his sin of brahmahatyā (killing a brāhmaṇa) and restored Sītā to Rāma after she had entered the fire to prove her chastity. Iconographically, Agni is represented as an old man with a red body. 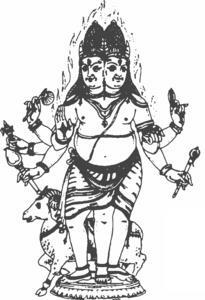 He has two heads, a big belly and six eyes, seven arms in which he holds objects like the spoon, ladle, fan etc., seven tongues, four horns and three legs. He has braided hair, wears red garments as also the yajñopa-vīta (sacred thread). He is attended on either side by his two consorts, Svāhā and Svadhā. The smoke is his banner and the ram his mount. Obviously this is an anthropomorphic representation of the sacrificial fire. As sacrificial fire, Agni has five aspects known as Pañcāgni: gārhapatya, āhavanīya, dakṣiṇā (or anvāhāryapacana), sabhya and āvasathya.